Daud Ismail, who has maintained his innocence since the start, has said that while he will continue to give his fullest cooperation to all parties, he hoped for a fair decision so he can continue to run his business as the laksa stall was his only source of income. 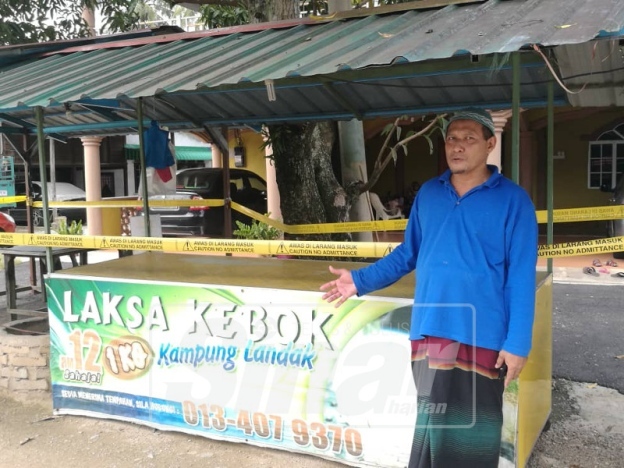 "I have no issues with the inspection as I have been running this business for a long time," the 'Laksa Kebok' stall owner was quoted as saying by NST Online, adding that he has cooperated with all health officials investigating the case. Ismail claims to have been open with the authorities and that he "allowed" them to inspect the kitchen area including "the place where we produce the laksa broth." "I have been doing this a long time and will continue to do it once I get the all clear from the health authorities," the 51-year-old told NST Online at his home today. Daud Ismail and his laksa stall located at Kampung Seri Landak in Kupang, Kedah. According to NST Online, a customer named Haslina Abd Wahab said she always ate the laksa at Ismail's stall, adding that she would always buy laksa from his stall. While she was shocked to read about the food poisoning cases, she hopes that there will be a thorough investigation by the authorities as the stall "appears clean". "I have never experienced any food poisoning after eating from the stall," NST Online quoted Haslina as saying, who added that she would continue to patronise the stall once the authorities have given it the all clear as the laksa was delicious. He said that reports in the media seem to have portrayed him as already guilty. "This thing has been viral in social media, so viral as if we were guilty as if we were making this laksa poisonous. We are depressed, for 15 years this is our income for children. But with the current situation, I am very sad," he was quoted as saying by Sinar Harian, adding that he hopes the people will not forward unverified news. Ismail is seen trying his own thick rice noodles used in his laksa. The factory is located in Negeri Sembilan. High sodium levels could increase the risk of heart attacks and strokes as well as cause high blood pressure.